Having been a teacher for more than 31 years, Walt Rogers could retire, but he doesn’t see much fun in that. Journal photo by Emily Williams. It takes a village to raise a child, an African proverb attests, but Mountain Brook High School science teacher Walter Rogers is hoping his students will take on the job of helping him raise his fitness level. Rogers is beginning to train for the Village 2 Village Run, a 7.5K being held March 9. He’s looking for students in his advanced placement biology and AP environmental science classes to hold him accountable to his goals. After having knee replacement surgery about three years ago, Rogers was successful in the recovery but fell of the wagon in terms of regular exercise. Through the challenge of getting into shape for the V2V run, he’s hoping to find an exercise routine that works with his busy schedule. It’s a busy schedule that he loves. Having been a teacher for more than 31 years, Rogers could retire, but he doesn’t see much fun in that. “I think that I’ve learned that the key to it is having fun,” he said. “It’s having fun and it makes every day enjoyable, more or less. I think that has helped me to enjoy my own life. Now it’s up to him to find that balance with exercise in his life. “I think the most difficult thing is finding the time, because our lives just become inundated with things to do,” he said. Rogers noted that one of his close friends gets up every morning at 4:30 a.m. and works out for two hours. That’s not the schedule that’s going to work for Rogers, so he’s trying to find his own sweet spot for exercising. “I’m trying to do it every day when I get out of school and then one of the weekend days, mostly Saturdays,” Rogers said. The work has already started, with Rogers working out on the treadmill, walking and running outside, doing rowing exercises and lifting weights to build muscle mass. For professional guidance, Rogers will begin visiting CoreLife Weight Loss Healthcare starting this week. Together with a professional, he’ll be able to set up a healthy training schedule and learn new techniques to get back into shape. The biggest hurdle that Walters foresees is simply being accountable for his exercise habits. “That’s the hardest thing, because it is so easy to let things come in the middle of it,” Rogers said. He said he has no family nearby to keep tabs on his progress. “I think I’m going to try to use my students to hold me accountable, because they will. They will,” he said. He’s already started asking his students to remind him to stay hydrated. “I have a hard time drinking water. … I told them, every day somebody say, ‘Have you had your water?’ So, I go and get a glass of water each period,” Rogers said. “You forget. They don’t. They’re looking forward to saying ‘Did you?’ because they love it when you haven’t. It doesn’t hurt that it is fairly easy to find the connections between the lessons in his biology classroom and his own experiences. “In AP environmental science, we’ve been talking about dehydration and they could not believe that gastrointestinal issues were the third leading cause of death worldwide,” Rogers said. To help his students realize why, they discussed the elderly and infants. Later in life, the ideas may come up when a student has his or her own child. Maybe, too, they will remember the semester they helped their teacher get back into shape. Either way, Rogers is looking forward to their help as he tackles the challenge to prepare for the 2019 V2V run. 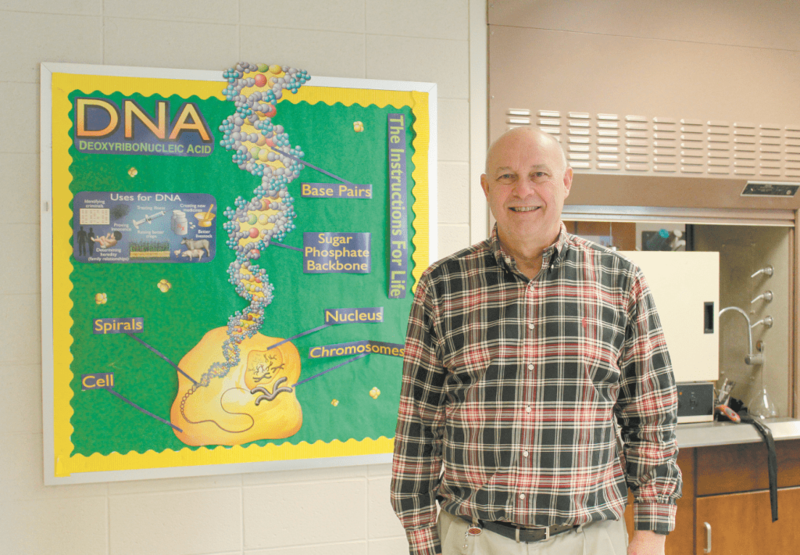 “That is how teaching has been for me, being challenged constantly and not settling for what you did 30 years ago,” he said. For more information on Village 2 Village, visit village2village10k.com.